Everyone’s favorite definitive “who will win” fighting game is back and it’s the biggest ever. It has all of the original stages, characters, and weapons from all previous games. Then it decided to add even more. Super Smash Bros Ultimate, developed and published by Nintendo is one of the fighting game league’s favorite games. With an aboslute massive set of characters and stages, they have outdone themselves. 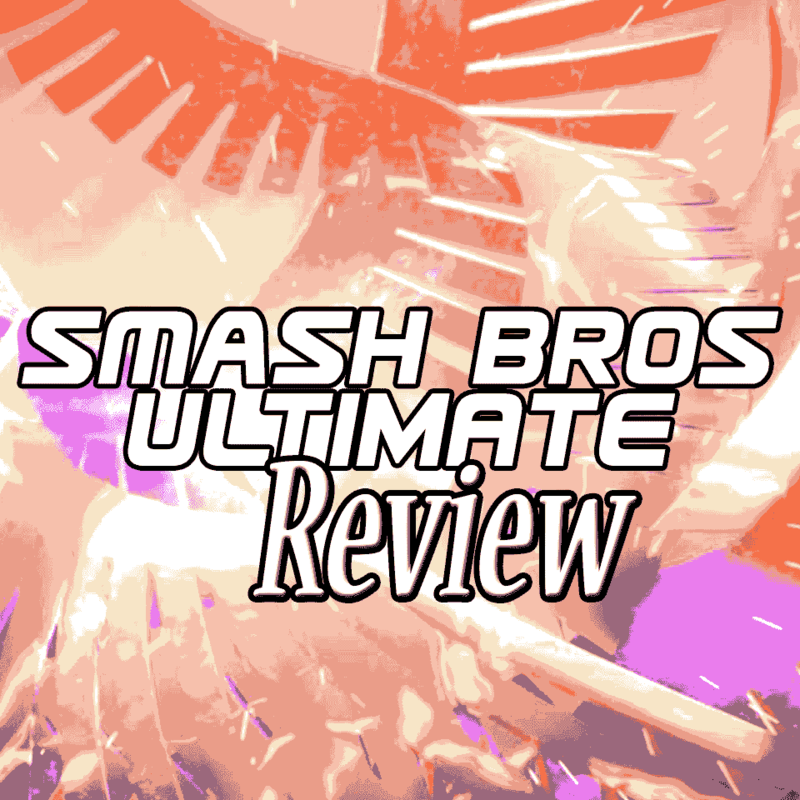 For fans of Smash Bros, this here is everything you ever wanted and more. For new player, good news, there’s a single player campaign and it’s not bad. I personally have never played Smash normally. And in fact, I hate the series overall. But only one person on my team has a Nintendo Switch. Guess who? Yeah, thought so. Anyway, how is the whole thing? Every old map as been fully modernized and updated to look amazing. Old stages perfectly blend in with the new ones with a very consistent art style. And the characters themselves have never looked better. Older smash bros gave a knockoff of your favorite characters, but Ultimate has the absolute best out of everyone. The customizable skins help too. Solid design overall, does exactly what was needed to be done. It also shows off the switch’s capabilities with flying colors. The single player campaign, “World of Light” is serviceable enough. It encourages the player to run around a big map. Like a chicken with its head cut off. All that was given for the plot is that this creature made all Nintendo characters evil and the only way to get them back is too free them on the map. Or alternatively, get a random battle while playing with friends. It’s just good enough that there’s nothing particularly wrong about the game’s structure. It’s more of an affirmation that people absolutely love this game and will sink hours into it, no matter what. Either way, the campaign results in a bunch of matches vs bots that have many different variables both on stages and on the character behavoir. I can’t remember a single song from the game but all of them aren’t very intrusive. A lot of the songs are edited versions of original tracks, only to be blasted by an unfamiliar theme that stresses you out. Other than that, the game hasn’t much wrong with the audio. Gameplay vocals are minimal, all characters sound exactly how they are supposed to. And of course, the attack sounds, a long with the vibration on the controller, is a great role to fit. Perfect hits and well times launches make for a fine experience. The plot is “stop the bad guy” but in a multiplayer focused game is hardly irrelevant. I haven’t yet wasted my own time by putting myself in danger of a 12 year old who’s great at it. But anyway, you just run around a path of multiple roads to get to find certain spirits that updrade your abilitiles. It has the pair of rock paper scissor into its gameplay of several games. Over all, I can’t see what’s especially good of this. Mt gripe is still the controls. I can absolutely own people in hack and slash games, and regular fighting games. But just a little later, add all just rust me and upstairs and find it. Otherwise, all I can do is just stand around in front of people and they all think I’m crazy. Alternatively, I can use this better button combo. Glad they offered control over not only inverting but the buttons too. I’m still not seeing this ever expanding work. I had fun when I won but playing is either a slog or random. The specific move sets off different character make it hard to pick someone you like. And its even worse when you get to a dead guy. Spoilers, btw. But yeah, I can’t bring myself top find anything relatable with the the characters. I was absolute glued to the sceen the first few days, but after several orther games dopped out, I just skipped out. I wish at this point that there is a master unlock. Even if I have to pay for it. I’d like to play as the characters I’ve been trying to play. Get this game if you’re a person who digs couch coop and once again wants to see which people will remain free. That’s just mumbo jumbo, tell me why I’m wrong in the comments. Looking forward to hear what everyone has to say. This is not a popular opinion to have. Then again, it’s not my opinion. It’s my mostly objective experience.